With the 110th annual Los Angeles Auto Show opening from Nov. 18 to 27, and with the local Petersen Automotive Museum launching its new exhibit, “Art of Bugatti,” this seemed like an appropriate time to learn about a local auto discovery made recently. To report, we welcome guest writer Leslie Kendall. BENTLEY CONTINENTAL as found after 30-plus dusty years of storage in the garage of a Hancock Park house. The term “barn find” immediately conjures excitement among those with a collecting instinct. The prospect of running across something of value that has been long hidden is so enticing that it has kept antique store patrons, classified ad readers and garage sale devotees busy for countless hours. The urge is no less keen for vintage car aficionados. And just when we think that everything that could possibly be of interest has been found, something else surfaces to give us reason to believe that there are indeed other noteworthy cars out there in dark garages, complete with the requisite layer of dust and four very flat tires. But it is not always necessary to go far for such discoveries. The perfect example of this is a certain 1953 Bentley R-Type Continental associated with James Bond creator Ian Fleming. And the place where it was hidden? Hancock Park. Like many other valuable vehicles, the Bentley Continental that Ian Fleming helped a friend custom order in late 1952 or early 1953 had been laid up in a garage for decades, probably because it needed work that was judged unnecessary during the years when it was considered merely a “used car.” Too precious to simply dispose of, the Bentley found its way to an unused space in the garage, the last owner (apparently a surgeon practicing in Beverly Hills, but now deceased) holding tightly to the dream of one day bringing it back to life and putting it back on the road. But the distractions of everyday living almost certainly got in the way to prevent the dream from being realized. Yet while we may bemoan the fact that such a worthy car languished seemingly unappreciated for so long, we can be grateful that it did so in Southern California, a rare part of the world with a dry, forgiving climate. Bentley R-Type Continentals are cars that are sought after today for the same reasons that they were sought after when they were new. They are uncommonly beautiful; a dignified blend of graceful curves, carefully sculpted contours, and an imposing stance. The watch-like precision with which they were built serves to contribute to a supremely refined driving experience. Even today, a thoroughbred Bentley Continental R can quietly outrun almost every other car on the road, and do so with great aplomb. Its exorbitant price (about $18,000 at a time where a comparable Ford was $1,700) assured an owner unmatched status. 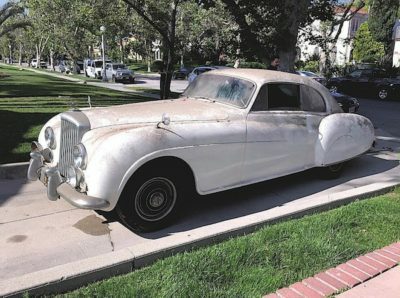 This particular and still unrestored Bentley recently had its re-sale offering price reduced to $1,395,000. Yet while they all share the same general appearance, each R-Type is a genuine one-of-a-kind, and it is doubtful that there were ever two equipped and trimmed exactly alike. In the case of this car, its individual history makes it a standout even among other R-Types. After all, who wouldn’t want to drive the car associated with the creative genius who dreamed up the debonair James Bond? Of more recent interest and importance is the originality of a garage find like the Bentley. Years ago, automobiles already in excellent — though not perfect — original condition were routinely restored. Although still attractive and serviceable, their original paint was stripped away, original upholstery discarded, and original engine components replaced with new. But that kind of treatment is no longer regarded as the norm. Great unrestored cars like the Bentley may have been repainted over time or suffer from a bit of deterioration, but they can still be thrilling to drive, and a thorough cosmetic and mechanical freshening may be all that is needed to return them to the road. The new owner will indeed have an exciting decision to make, one that thoroughbred vehicle fanciers will be waiting for with considerable interest. Now I wonder what else is out there in the garages of Hancock Park! « El Nino Garden Gala, LACO à La Carte in Fremont Pl.